The Hardwick Street Café offers an experience you can’t find anywhere else in the Northeast Kingdom. Located within the Highland Center of the Arts (HCA), this café gives new meaning to dinner and a show. To begin with, the space is beautiful, warm, and inviting. Large glass windows and glass doors that lead to a patio and yard shared with the HCA really bring the outside in and make the café bright. Art is heavily featured in the space and fills built in shelving, tying the café beautifully into the larger space. Upon arrival you walk into the Center, pass the art exhibit lining the walls, and are drawn into the large anti-room that rivals galleries in any big city. The entrance to the Hardwick Street Café is easy to spot, and you’re immediately met with their dessert display. The bar along the back wall draws your gaze deeper into the space, welcoming guests for dinner and drinks. The night we dined was fairly quiet because we picked a night when there was no entertainment. But, it was nice to see a few families come in just for dinner. 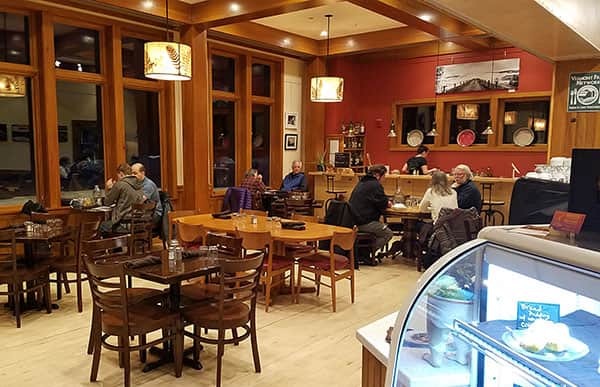 Throughout the winter the café features trivia and live music, interspersed with the larger music events, performances, and movies that the Highland Center of the Arts hosts throughout the week. In the summer the place can be packed. Performances bring in visitors, summer residents, and locals from towns in driving distance and beyond. I was the most excited by their small plate menu and a list of inventive cocktails worthy of any high end bar. I love tapas (small plates) and appetizers. They give me the opportunity to try so many delicious things. So when I saw the small plate menu at the Hardwick Street Café I was thrilled. The first things I noticed were the assortments they offer and how many items were produced from within driving distance from the restaurant. The cheese plate features Jasper Hill Cheeses from right in Greensboro, the snack platter and salmon plate used locally made Matzoh, meals are made with Hill Farmstead Beer (made in Greensboro) and other Jasper Hill Cheeses as well as locally raised produce and meats. And all eggs from both the breakfast and dinner menu are sourced from a local farm. I was truly in my element! We started our meal with three small plates – two from the menu and one on special. The snack platter is a great vegetarian option that could also be a kid pleaser. 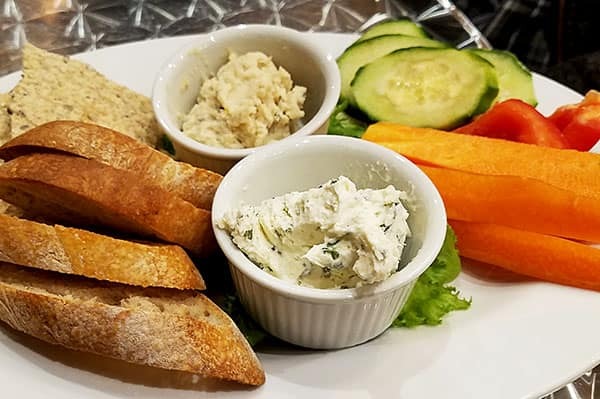 A delicious and light white bean rosemary dip that closely resembles a traditional hummus and a delicate herbed cheese spread are served with matzoh crackers from Patchwork Farm and Bakery and an assortment of veggies. The subtle flavors and recognizable items are perfect for little ones. And I found it a great alternative to a salad course. The smoked salmon plate was my favorite. 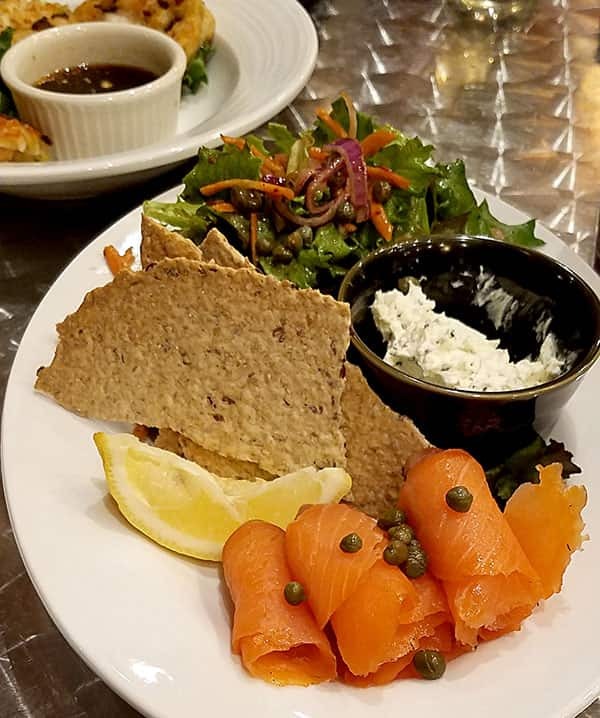 Definitely for those with more adventurous palettes, this dish came with thinly sliced smoked salmon served with an herbed cheese spread, pickled red onion, capers, a pile of greens, and the matzoh crackers. I could have eaten this entire platter myself it was so delicious. All of the flavors are light and a bit salty so went with my cocktail nicely. I can see these two plates as being a perfect meal on a hot summer’s day, or a great snack at intermission. 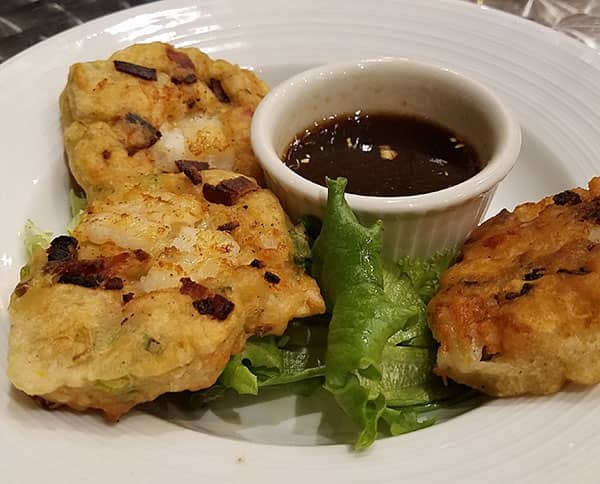 The night we dined, the appetizer on special was a fish cake served with Asian dipping sauce. The cake was well made with a lot of fish and not heavy on filler. The light fish flavors were enhanced with the bright and stronger flavor of fresh green onion and the salty, soy based, dipping sauce. Moving into the main course, I was surprised to find such varied options. The restaurant really is a café in the true sense, focusing more on lighter dishes that come out quickly. That being said, their sandwich options show a lot of variety and all feature high quality ingredients. They also offer a Vermont produced bratwurst, pork loin, and a vegetarian crispy rice bowl. 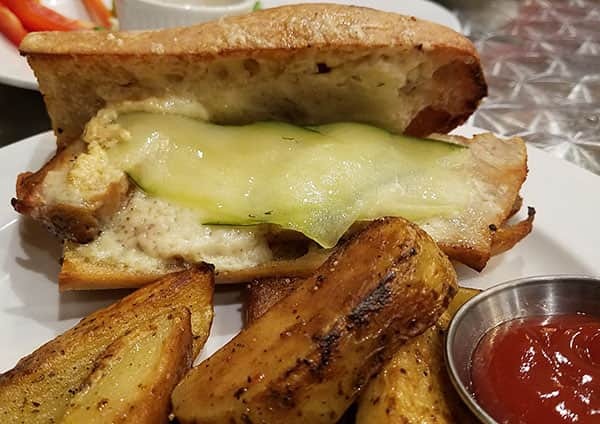 Sandwiches are served with herbed potato wedges instead of French fries – a healthier, more flavorful option that adds to the high quality flavor and presentation. To fill out the menu, many items are available as add-ons to your meals. A cheese selection, Hill Farmstead Edward soaked peppers and onions, shrimp, and white Spanish anchovies are just a few of these add-ons. 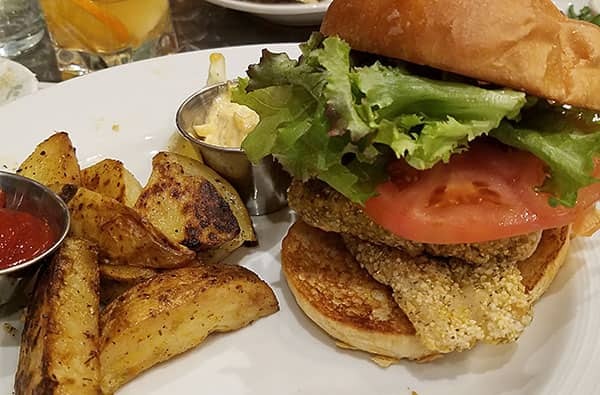 I ordered the fish sandwich, a fresh filet that is breaded and sautéed then served with lettuce, tomato, and a sriracha aioli on a brioche bun. The fish was seasoned and well cooked. The breading was very basic so the fish and aioli dominated the flavor profile. My husband ordered the Greensboro Cuban, a warm sandwich made from a brined pork loin and Canadian bacon served on a toasted baguette with melted Alpha Tolman cheese from Jasper Hill, a Dijon aioli, and house made pickles. The ingredients were all superb, and the flavors do go well together. But, this isn’t like other Cuban sandwiches, as the Alpha Tolman has a distinctive flavor. If you like strong cheeses then this sandwich is perfect for you. The regular burger is a Vermont beef patty served with plenty of toppings and a nice brioche bun. My son was happy with his order, and I found the patty to be well cooked and very tasty. 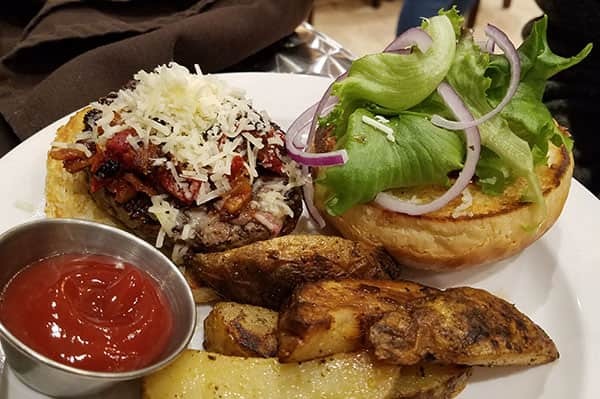 The addition of bacon to the burger was available, and of course everything is better with bacon! Over all we were happy with the meal here. Simple food done well! And so many of these items are light and pair well together. We left discussing the items we look forward to trying the next visit – such as the house-made pickle plate with the salmon plate, the baked Little Hosmer (like baked brie), and I’m interested in the TB&J (roasted tomatoes with an onion jam and the white bean spread from the menu with greens and cucumbers) as I think it will be the perfect sandwich to go with these platters. This little bar, though stocked with mostly basic items, features many Vermont spirits, wines, and beers. I started my meal with their signature Tom Cat old fashion. This cocktail uses Tom Cat gin from Caledonia Spirits in Hardwick, VT – a honey based gin that is aged in whiskey barrels giving it a distinct color and flavor – blended with bitters, maple syrup, and served with an orange slice. It was fantastic. 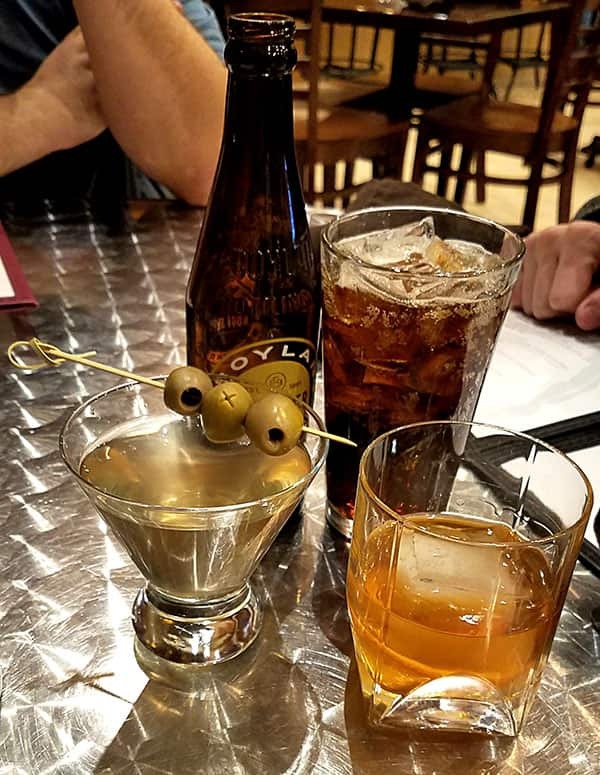 My husband tried his standard martini, a decent sized cocktail complete with a beautiful presentation. We were also impressed with the bottled sodas that were delicious in flavor and simple in ingredients. Overall the experience at the Hardwick Street Café in Greensboro, VT is a unique one in the NEK, and I dare say in Vermont as a whole. There is a touch of more urban culture to the venue and the presentation of art is one not to be found elsewhere in the Kingdom. The location is beautiful, the food high quality and well done, and the venue offers so much more than the food. Driving through the region, make sure to add the Hardwick Street Café and Highland Center for the Arts to your list of stops. Or, plan a date night with dinner and a show for a fantastic night out. And with many movies, comedy events, and great musical experiences the venue provides many experiences to be enjoyed by whole family.